China Changshu Men's Clothing Index Report showings the development of the industry through visualization data and provides important information for the men's Clothing economy. China Changshu Men's Clothing Index Report was published in 2014, and one quarterly one edition. It is include men's clothing price index and men's clothing prosperity index as the main data, then explaining the development trend of China's men's clothing industry; In addition, it for the majority of readers to provide accurate, professional market analysis, statistical data and other industry information through the men's Clothing market research report, men's Clothing consumer questionnaire report, chemical fiber industry production and operation analysis, men's Clothing business financial analysis, men's retail market status as well as men's Clothing fashion trends and other reports. 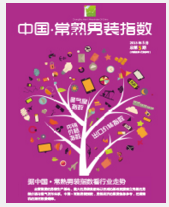 China Changshu Men's Clothing Index Report magazine's main readers: clothing and related business decision-makers, senior management; governments; clothing professional market; all levels of textile, clothing industry associations; University library and so on.